You are purchasing one LASORB EDS protection system for laser diodes for Blue frequencies. AixiZ is an authorized distributor of Pangolin products. 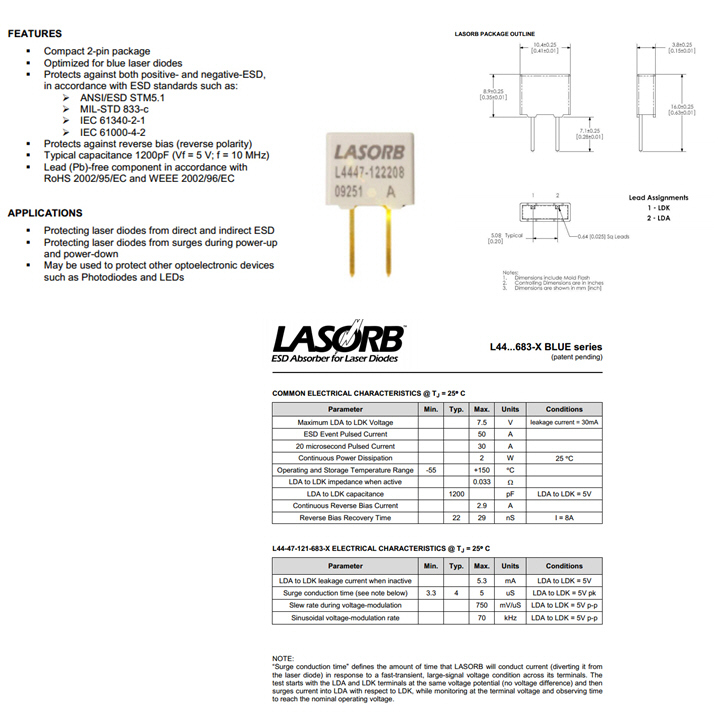 GENERAL APPLICATION INFORMATION LASORB is a device that is specifically designed and tested to protect laser diodes from ESD and power surges. LASORB overcomes the problems of previously-known ESD protection schemes by preventing reverse-bias of the laser diode under all conditions, and also by preventing ESD or other power-related faults from exceeding the maximum forward-bias voltage of the laser diode. LASORB is able to do this while not adding significant resistance or capacitance to the laser system. CONNECTING LASORB TO THE LASER DIODE LASORB is connected directly to the terminals of a laser diode. The LDA terminal is connected to the Laser Diode Anode, and the LDK terminal is connected directly to the Laser Diode Cathode. LASORB should be connected as closely as possible to the laser diode - certainly no greater than one centimeter away, thus preventing stray inductance in between the laser diode and the ESD protection means.